This is a brief history of how i came to producing my own Super-8 films. My Super 8mm cameras of choice the Braun Nizo 2056 Sound and later the Braun NIZO 6080 Super 8mm Sound. The Braun Nizo 6080 is a highly specified camera with a superb Schneider 7-80mm lens. An ideal camera for music promos or lower budget. Launched in 1965, Super-8 film comes in plastic light-proof cartridges containing coaxial supply and take-up spools loaded with 50 feet of film. This was enough film for 2.5 minutes at the U.S. motion picture professional standard of 24 frames per second, and for 3 minutes and 20 seconds of continuous filming at 18 frames per second (upgraded from Standard 8 mm's 16 frame/s) for amateur use, for a total of approximately 3,600 frames per film cartridge. A 200-foot cartridge later became available which could be used in specifically designed cameras, but that Kodak cartridge is no longer produced. Super 8 film was typically a reversal stock. In the 1990s Pro-8 mm pioneered custom loading of several Super-8 stocks. Today Super 8 color negative film is available directly from Kodak for professional use and is typically transferred to video through the Telecine process for use in Television advertisement, music videos and other film projects. The Super-8 plastic cartridge is probably the fastest loading film system ever developed as it can be loaded into the Super-8 camera in less than two seconds without the need to directly thread or even touch the film. In addition, coded notches cut into the Super-8 film cartridge exterior allowed the camera to recognize the film speed automatically. Not all cameras can read all the notches correctly though and not all cartridges are notched correctly such as Kodak Vision2 200T. Usually, testing one cartridge of film can help handle any uncertainty a filmmaker may have about how well their Super-8 camera reads different film stocks. Color stocks were generally available only in tungsten (3400K), and almost all Super 8 cameras come with a switchable daylight filter built in, allowing for both indoor and outdoor shooting. The original Super-8 film release was a silent system only, but in 1973 a sound on film version was released. The sound film had a magnetic soundtrack and came in larger cartridges than the original so as to accommodate a longer film path (required for smoothing the film movement before it reached the recording head), and a second aperture for the recording head. Sound cameras were compatible with silent cartridges, but not vice versa. Sound film was typically filmed at a speed of 18 or 24 frames per second. Kodak discontinued the production of Super 8 sound film in 1997, citing environmental regulations as the reason (the adhesive used to bond the magnetic track to the film was environmentally hazardous). Kodak still manufactures several color and black-and-white Super 8 reversal film stocks, but in 2005 announced the discontinuation of the most popular stock Kodachrome due to the decline of facilities equipped with the equipment for the K-14 process. Kodachrome was "replaced" by a new ISO 64 Ektachrome, which used the simpler E-6 process There were only two Kodachrome labs in the entire world whereas now, all Super-8 film stocks, from color and black and white reversal, to color negative, can be processed same day in several labs around the world. In august 1974 in USA, Eastman Kodak presented Super 8 Direct Sound System: sound recording on magnetic striped film. 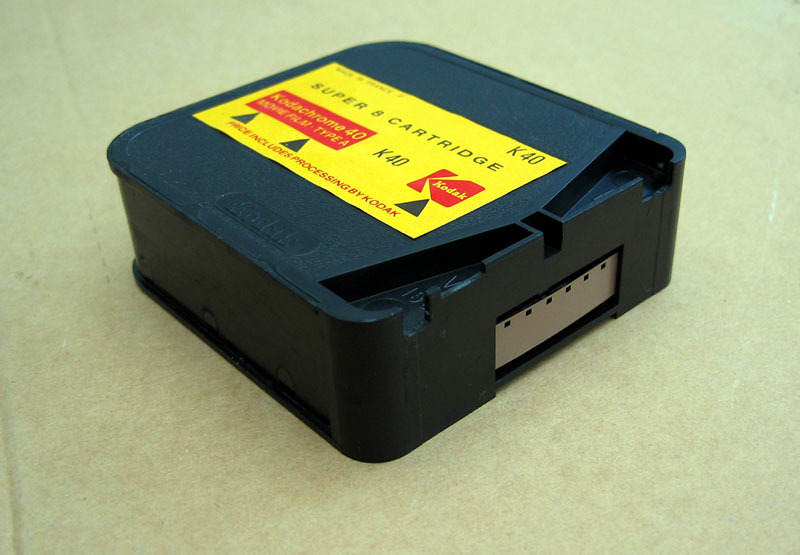 The cartridge that contains the sound film was longer than the silent cartridge. But the new sound cameras were compatible with both cartridges. Kodak marketed the Ektasound series and the new cartridge with 2 different emulsions: Kodachrome II Sound and Ektachrome 160 A Sound. Kodak has also introduced several Super 8 negative stocks cut from their Vision film series, ISO 200 and ISO 500 which can be used in very low light. Kodak reformulated the emulsions for the B&W reversal stocks Plus-X (ISO 100) and Tri-X (ISO 200), in order to give them more sharpness. Many updates of film stocks are in response to the improvement of digital video technology. 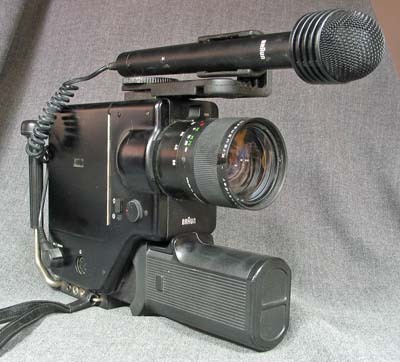 The growing popularity and availability of non-linear editing systems has allowed film-makers to shoot Super-8 film but edit on video, thereby avoiding much of the scratches and dust that can accrue when editing the actual film. Super-8 Films may be transferred through telecine to video and then imported into computer-based editing systems. Along with the computer editing option a number of enthusiasts still choose to edit super 8 film with a viewer and rewinds and then project their edit master on a film projector and movie screen. This was in the late 60’s and I started my collection with silent Standard 8 and later, Super 8 films which I either ordered by mail or found in department stores. Prices for films of this length averaged between five and seven dollars. It must have been around 1970 that I stumbled upon an ad for a 200 foot film for only $1.00! It was called PREVUE 8 and contained scenes from great classic silent films from a company I’d never heard of! I had saved enough to buy my first mono super 8 sound (SOUND!) projector, a Heurtier P6-24B. In case you’re wondering, my first sound film was Laurel & Hardy’s THE LIVE GHOST in Super 8. This is the finest, rarest and most expensive Super 8 projector ever produced in the world and only very few around because of the very high production cost at that time,& the incredibly high price that they were selling it. I'm not quite sure what this projector would cost today, but I would presume way over 3000.00 Euro! It comes with all its manuals, two microphones, with its two wooden stereo high-quality speakers,& its carry case.General Characteristics of the Stereo 42. Features of the Projector: Overall dimensions: length 350mm, width 300mm, and height 210mm, weight:15 kg. Automatic or semi-automatic threading. two speeds: 18 frames per second, and 24 frames per second, and reverse projection. Fast rewind. Instantaneous start free of wow. Wow, less than 0.5%-Flutter less than 0.5% Motor with an external rotor. Automatic lighting of the pilot and projection lamps: 100w, 12 v with built-in- mirror. Fused circuitry Image Framing:+,_ 1/3 of a frame approximately. Removable pressure plate. Zoom lens f1.3. Focal Length 15-30mm. Features of the Recorder: 3 magnetic heads: erase, record/playback, monitoring, Monaural recording on channel 1 or 2, on Channels 1 & 2 in parallel, and in Stereo. possible playback of channels 1& 2 in parallel with balance control. The possibility of playing back Channel 1 while recording on Channel 2. Public Address in Mono and Stereo. Echo on Channel 1 & channel 2. Superimposition in Mono and Stereo with progressive decrease and increase of pre-recorded musical background. Mixer for phono and mike inputs.Automatic volume control on Channel 1,2, and on parallel channels. VU meters for manual input control on channel 1,2, parallel and Stereo. The Automatic cutoff of playback and recording in reverse projection. The electronic cutoff in case of amplifier overload. Power output: 2x6 W rms over 8-ohm speakers. In the years to come up to 16mm and even build a screening room in my house. I’ve made friends with some terrific people who share this crazy hobby, many of them through this site.